The one-sided relationship between the Philippines and the United States dates back to 1902 when the last revolutionaries capitulated to the US military after fighting the Spanish 6 years before. The Spanish American War resulted in the transfer of control over this country from the Spaniards into the hands of the Americans. The Treaty of Paris which governs said transfer involved a payment of $20 million made to Spain not by Americans, as standard history books would tell the public, but was actually paid for by sovereign personalities. Therefore, the Americans should never have any authority over the islands in the first place. For 113 years this American colony has been relishing unprecedented economic growth which resulted to the country having one of the most fearsome military forces in the region. Behold the symbol of Philippine-United States Friendship! The BRP Sierra Madre, a marooned transport ship which Philippine Marines live on in the disputed Second Thomas Shoal, part of the Spratly Islands. The Philippine navy is quietly reinforcing the rusting ship even as Beijing creates a string of man-made islands nearby. Photograph: Erik de Castro/Reuters Click on the image to enlarge. The Philippine navy is quietly reinforcing the hull and deck of a rusting ship it ran aground on a disputed South China Sea reef in 1999 to stop it breaking apart, determined to hold the shoal as Beijing creates a string of man-made islands nearby. Using wooden fishing boats and other small craft, the navy has run the gauntlet of the Chinese coastguard to move cement, steel, cabling and welding equipment to the BRP Sierra Madre since late last year, two navy officers who have been inside the vessel told Reuters in recent interviews. The 100 metre-long (330-foot) tank landing ship was built for the U.S. Navy during World War Two. It was eventually transferred to the Philippine navy, which deliberately grounded it on Second Thomas Shoal to mark Manila’s claim to the reef in the Spratly archipelago of the South China Sea. A small contingent of Philippine soldiers are stationed onboard. Manila regards Second Thomas Shoal, which lies 105 nautical miles (195 km) southwest of the Philippine region of Palawan, as being within its 200-nautical mile exclusive economic zone. China, which claims virtually all the South China Sea, says the reef is part of its territory. “We know China has been waiting for the ship to disintegrate but we are doing everything to hold it together,” said one of the officers, adding that while the work was progressing slowly, it should be finished by the year-end. The other naval officer said welding was being done at night because of the heat. Concrete foundations were being laid inside the ship’s hull to try to stabilise it, he added. Without giving exact dates, both sources said they witnessed the repairs taking place earlier this year. They declined to be identified because they were not authorised to speak to the media. The soldiers currently stationed on the ship, who are demolition experts, were doing the work, said the second source. Just to the west of Second Thomas Shoal is Mischief Reef, one of seven coral formations in the Spratlys that China is rapidly turning into islands that Beijing says will have undefined military purposes. Vietnam, Malaysia, Taiwan and Brunei also have overlapping claims to the Spratly waterway, which is some 1,100 km (680 miles) from the Chinese mainland. Asked about the repairs, Philippine Foreign Ministry spokesman Charles Jose declined to comment. But such work would not violate an informal code of conduct signed in 2002 by China and Southeast Asian states that prohibited any change to the status quo in disputed areas, he said. “In our view, repairs and maintenance of existing facilities are allowed … especially if such repairs and maintenance work are for the safety of our personnel and safety of navigation,” Jose added. The Philippine Defence Ministry declined to comment. China’s Defence and Foreign Ministries did not respond to a request for comment. A Philippine general familiar with the repairs told Reuters the ship’s hull and deck were being strengthened, and air-conditioning units added. “We are improving the living quarters inside, to make life for our soldiers more comfortable,” he said, declining to give further details about the repairs or be identified. 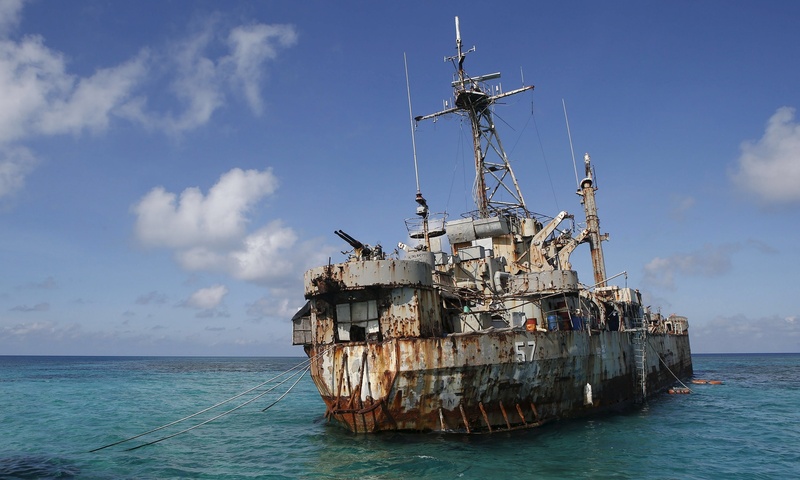 Pictures taken by a Reuters photographer who sailed to the BRP Sierra Madre with other media in March last year show a pockmarked vessel covered in rust, sitting on the permanently submerged reef but listing slightly to one side. Much of the boat’s hull is visible. Besides being a military outpost, the BRP Sierra Madre is also a commissioned Philippine navy ship. That means Manila could request U.S. military assistance under a decades-old security treaty with Washington if the ship was attacked, said senior Philippine military officials. “Even if it’s covered with rust, it will remain an active duty commissioned navy ship. It’s a symbol of our sovereignty,” said the Philippine general. Second Thomas Shoal illustrates the mismatch in power between the Philippines and China. Since the start of 2014, the Philippine navy’s regular attempts to re-supply soldiers on the BRP Sierra Madre with food and water have become a cat-and-mouse routine, with large Chinese coastguard vessels on patrol in the area trying to block the path of the smaller Philippine boats, naval officials said. The Philippine vessels have always gotten through by making a run for the shoal’s shallow waters, which aren’t deep enough for the Chinese coastguard, naval officials said. The tear-shaped shoal itself is large, some 10-11 nautical miles from top to bottom. Zhang Baohui, a mainland security expert at Hong Kong’s Lingnan University, said Beijing would be angry about the repairs, adding that Chinese ships would probably continue their “menacing” tactics. But they would not do anything that could be considered an act of war, Zhang said. “The larger geo-strategic context is more important than Second Thomas Shoal,” he said. Project another 113 years into the future, this group of islands would be an unrecognizable wasteland.